The fibre-optic photo-eye option is the alternative to the standard encoder measurement of cut length. 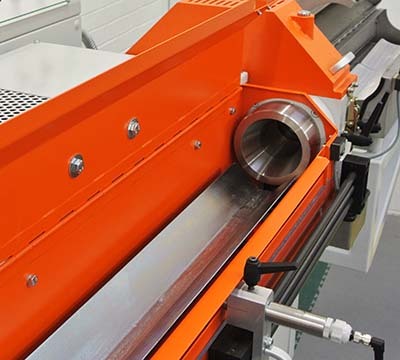 It is particularly recommended for rigid plastic extrusions where a high degree of cut length accuracy is required. The photo-eye detects the extrusion as it moves past the end of the eye. The position of the photo-eye is adjustable so that the correct cut length distance can be set (up to a maximum cut length of 600 mm). The length adjustment is made via a micrometer style handwheel. This moves the photo-eye back & forth via a linear screw thread. A digital position readout is provided so that the exact settings can be repeated as required. The type of photo-eye will depend on the colour of the plastic being sensed. Reflective sensors are best for lighter or clear products whilst thru-beam sensors work best with dull or dark colours. A stand‐alone rotary cutter for when you already have a caterpillar infeeder/puller machine. Free-standing rotary cutters with integral infra-red or hot air pre-heater tunnels.